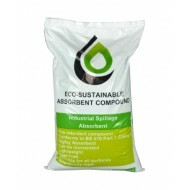 Industrial Absorbent Granules for the absorption of spillages in an Industrial environment. This range of Absorbent Granules come in many different sizes, all absorbing spills in a quick and safe manner. Click to view our entire range of Absorbent Granules. Bags of Multi Zorb Clay Granule absorbents. For use absorbing any type of liquid spillages. 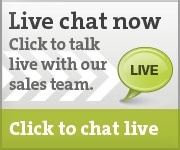 Ideally suited to garage work areas and industrial premises. 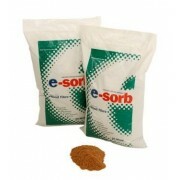 Bags of Esorb Flame Retardent Loose Granule absorbents. Each bag will absorb up to 30 litres of fluids. Mined and processed from natural clay. 15 litre bags of Spill Fix loose absorbents. Provides an almost instant absorption of most hydrocarbon spills. Spill Fix is made up of millions of micro sponges and can absorb up to 9 times its own weight in liquids. Each bag will absorb up to 15 litres of fluids. 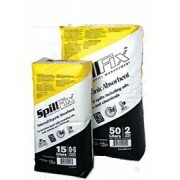 50 litre bags of Spill Fix loose absorbents. Each bag will absorb up to 50 litres of fluids. 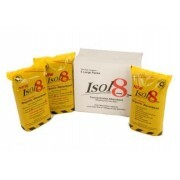 5 bags of Isol8 Granular absorbents. For use absorbing many types of spills, including oil, fuels, paints, acids, anti freeze and water. 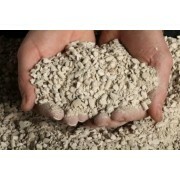 Made from 100% recycled natural materials, meaning savings on costs of disposal over clay granules. Each bag will absorb up to 10 litres of fluids. Absorbs water and oil spills. Instantly absorbs oil and water spills.